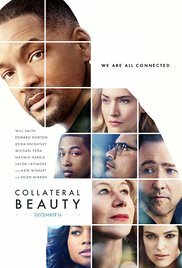 I’m afraid “Collateral Beauty” is just another film pulled along by a spiral of negativity among critics. Sometimes it happens that a certain opinion is being introduced and others use it as a guideline. Slogans such as “Atrocious cynical and tearful”, “A tearjerker without value” and “Pretentiously hot air” appeared on my screen to my surprise. Admittedly, it isn’t as peerless as “The pursuit of happiness“. But it’s not such a commercial nonsense as “Men in Black II” or as annoying as “After Earth“. Maybe Will Smith isn’t the perfect actor for a melodrama and you associate him with a more action-packed and lighter genre. Yet he could convince me as the grieving owner of an advertising agency. Everytime a sort of global crusade is being organized against a particular movie and I don’t agree with the used arguments, I feel like throwing myself into the breach for it. The last time I felt this urge was with “47 Ronin“. I admit, a film like “Hold Me” brings up more emotions when it’s about dying and saying goodbye to someone dear. And contentwise there are plenty of elements so you could label it as a melodrama. But what was the ultimate message? Is the movie solely about suffering, sorrow and pain? Or was the message also about that glimmer of hope, overcoming personal demons and recognizing the real values that are important in a human life? Well, cynics will look at it in a disgusted way. And yes, I myself thought that the end reached a high “Scrooge” level. Three metaphors trying to steer the lives of four individuals in the right direction. Not only the life of Howard (Will Smith) needs a little bit of steering. The three co-owners Whit (Edward Norton), Claire (Kate Winslet) and Simon (Michael Pena) have to deal with their own demons. Each of them will get the help of a metaphor to dot the i’s en cross the t’s. Their joint project is Howard, who leads a comatose and aimlessly life since the death of his six year old daughter (she suffered from a rare form of cancer). The charismatic appearance in the beginning of the film contrasts sharply with the self-destructive person who rides his bike against traffic like a kamikaze blinded by rage. He doesn’t care about what will happen with the company he founded. Since months, his only activity there is designing a structure of dominoes. And after several days of hard work, he breaks it down by pushing the first domino. Is this self-destruction in a symbolic way? The first step to join a support group for people trying to handle a loss, is an impossible step for Howard. The next thing Whit, Claire and Simon come up with is a plan to proove that Howard is of unsound mind and can’t take any decision because it could harm the firm. That’s when three amateur actors enter the picture. Brigitte (Helen Mirren), Amy (Keira Knightley) and Raffi (Jacob Latimore) will perform each as one of the three abstractions and confront Howard with his writings. That is, the letters he writes to the abstractions. In this way they try to provoke an aggressive or irrational reaction. Critics in The US panned the film mercilessly because of exaggerated dramatics and according to public opinion a disgusting preconceived plan of the other shareholders. Let me counter these arguments. Take any season of Grays Anatomy and you’ll be drowning in a pool of artificial drama and sickening emotional nonsense (but this is probably due to my hatred for television series). And saying the plan of the co-owners is morally offensive, is a hypocritical statement. I’m sure in the US (and other major capitalist countries) strategies like this are being used on a daily basis, trampling other individuals without pity and pushing them aside strategically. And pointing at Will Smith while claiming he isn’t capable to bear a serious film, is also jumping to conclusions. I can’t stand Keira Knightley (a film with her in it, and my cozy couch is covered with marks of my fingernails). But that’s no reason for me to proclaim the film is totally crap (“Begin Again” is an example of that). “Collateral Beauty” is a wonderful film about grief and the consequences when losing a loved one. Admittedly it was a bit predictable. The connection between Madeline (Naomie Harris) and Howard was quite clear upfront. And the end was a bit too magical. But ultimately, I felt the film struck a chord and left an impression on me. Will Smith didn’t succeed in moving me to tears as in “The pursuit of happiness“. And the crying part isn’t his strongest talent as an actor. But I still have respect for the person who started as a rebellious, yo-yo-yo rapping teen from Bel-Air. So beware of the bashing and look at it with an open mind. This was an exceptional movie and should be one the must watch in your bucket. Will Smith enhanced the character given to him and the other actors also did a mind blowing job.